The three of us settle against an old stone wall in the ruins of a cathedral. We put on layers of clothing and pile our backpacks along one edge to block the wind. Time drifts by, a light rain comes and goes, we share cookies and jokes. The albergue will open in an hour. We’ll settle into bunk beds and make dinner in the kitchen. The two Germans and Jorgelina will laugh as I try and cook a pizza on a stove top in a pan half its size. Then they’ll cheer when it comes out alright. Daya will eat something green, like she always does. The Germans will have a drink or two. Jorgelina will sip mate. But I’ll miss that hour in the ruins, the three of us at peace with the wait, at peace with the people walking by. No one stared at us, no one questioned what we were doing. This is the Camino and we have a place in this world. We are expected and welcome. We are part of the social order. I remember walking into Pamplona when Carola told me that she felt so out of place with her backpack, with her clothes a bit dirty. “Everyone’s looking at me,” she said. I laughed. I felt the opposite. I felt for the first time in forever that no one was looking at me, no one cared. 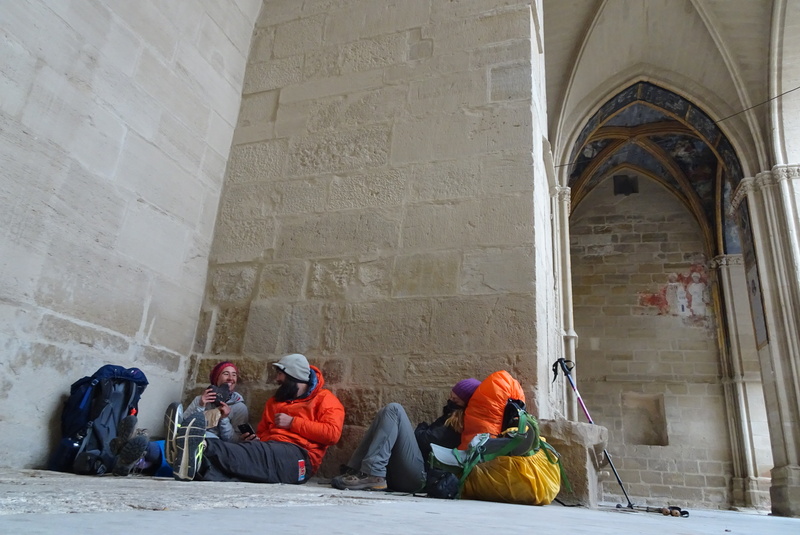 We were just more pilgrims on the way to Santiago, nothing of note, nothing out of place, just a part of the world. I doze off as we wait in the cathedral’s ruins, comfortable even as the wind swirls among the old stones and breaks against my jacket. I am the same person who walked past Danish towns and through the streets of Hamburg, who passed Italian vineyards and French villages, but the world has shifted here, made peace with me, recognized me as part of it. I am no longer odd, no longer different. I don’t draw looks and stares. People don’t cross the street when I walk by. I feel it in every moment here, that almost invisible acceptance, that comfort of place. This has been my home for so long, but only now does the world seem to recognize it, only now do I realize how heavy it was to not have a place, how it weighed in every moment, how it flooded every thought. The heaviness is gone and I feel so free. So I sleep, comfortable in the ruins, comfortable in my home, comfortable with my place in the world. After months of long cold journeying, these days of company and sunshine have been well earned! Have you heard of Oliver Shroer, a Canadian fiddler/violinist who walked the Camino in 2004? He recorded his solo performances as well as sounds of the Camino along the way. I hear it playing in my mind as I read your posts. Be well! Acceptance, what a gift. Beautiful post and picture! So sweet to hear this! You can relax and enjoy in a way that has not been before on this joourney. Funny how this was made to happen. A gift. Also a gift to recognise it!